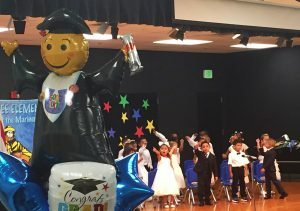 Students of Weatherbee’s two VPK classes were recently promoted to Kindergarten. Congratulations boys and girls! Thank you to Mrs. Norma Miller, Mrs. Joan Barnett, Mrs. LaDonna Guerrier, and Mrs. Maureen Webster for the stellar work you do each year with our youngest Mariners!